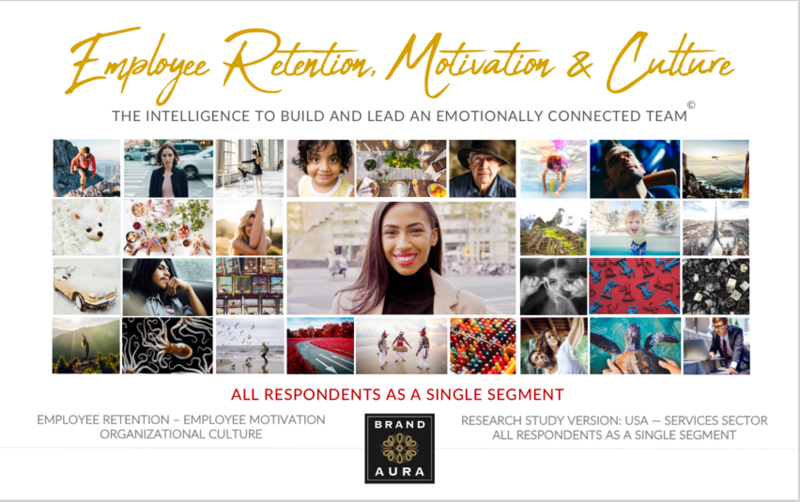 BrandAura.com Announces New Organizational Culture Research To Help Business Leaders To Improve Employee Retention And Organizational Culture. Among The Key Findings: Females and Millennials Are Motivated Most by Quality of Life, And They Are Much More Likely To Leave Employers Over Inadequate Recognition. "Business leaders can use these insights to keep a watchful eye on the employee segments who may be most at risk while offering the most relevant coaching, nurturing, benefits, and rewards to help employees feel appreciated and committed," adds Harold Kelley, Brand Aura CEO & Founder. Females and millennials are motivated most by an aspirational commitment to 'quality of life,' and they are at least 43% more likely to leave their employers over inadequate recognition. These are among the compelling findings from new research on organizational culture, employee retention, and employee motivation published by BrandAura.com. 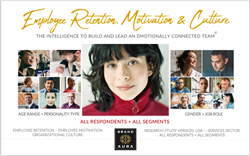 The unique, multidimensional research from Brand Aura leverages emotional intelligence to help business leaders to improve employee retention and organizational culture. In key areas of the research, a methodology was used to bypass respondents' logical brain to gather intelligence from their emotional core where as much as 90% of human decisions are made. Employee Retention, Motivation & Culture - The Intelligence To Build And Lead An Emotionally Connected Team is a 320-page report that reveals the findings from a study of 334 services sector employees in the United States. The study includes results for all respondents as a single segment plus 11 additional breakouts of employees by gender, age range, personality type, and job role. Four versions of the report are available at the company's website, BrandAura.com. One of the study's compelling findings, among many, is that "Quality of Life" was the most dominant motivator for females and millennials. It was also of most importance for marketers. Quality of Life represents the aspirational journey one takes towards a better life including the strength and hope to overcome adversity; maintaining a healthy mind, body, and spirit; and opening oneself up to new learning and adventures. The findings do not mean that other employee segments are not also motivated by Quality of Life, only that it was more important for females by 20%, for millennials by 48%, and for marketers by 35%. In total, there were 7 motivational themes and 7 organizational culture themes that emerged. In addition to employee motivation and organizational culture, the research examines 57 influence factors of employee retention across 8 categories. This is part of Brand Aura's proprietary Cultural Retention Index™ scoring. One such category, Recognition, includes opportunities for promotions, opportunities to lead or join special projects, opportunities to share info with leadership, and acknowledgement and awards. The research found that females were 43% more likely - and millennials 59% more likely - to leave their employers over perceived inadequate recognition. Topping all segments was introverts, who were more than twice as likely to leave for the same reason. "Business leaders can use these insights to keep a watchful eye on the employee segments who may be most at risk while offering the most relevant coaching, nurturing, benefits, and rewards to help employees feel appreciated and committed," adds Brand Aura CEO & Founder, Harold Kelley. Brand Aura also announces that it is offering a free book by its CEO & Founder, Harold Kelley, as a Pre-Publication Edition on BrandAura.com. The book, Hear Their Hearts - Transform Your Culture, Innovation, And Growth With Emotional Intelligence, is a fast-paced story of leadership conversations on employee retention and growth. Brand Aura, LLC, (BrandAura.com) is a marketing research, publishing, and consulting company that leverages emotional intelligence to help business leaders improve employee retention, organizational culture, product innovation, and marketing to achieve sustained growth. Brand Aura commissions and produces research reports offered via BrandAura.com. The company also performs custom marketing research of clients' own employees and customers in the areas of organizational culture, product innovation, marketing, and branding. Brand Aura is headquartered in Boston, MA, USA.